The biggest Christmas gift for most Star Wars fans this year will be the release of Rogue One: A Star Wars Story, the first Star Wars spinoff that is set to hit theaters December 16. We reported over the weekend that the new trailer will debut Thursday night during Olympic coverage on NBC, but while we wait for this footage, we have new story details from director Gareth Edwards. The filmmaker reveals that there will be a Jedi holy land revealed in this movie, a new planet known as Jedha. We've known for quite some time that Rogue One will be set between the events of Star Wars: Episode III - Revenge of the Sith and the 1977 classic that started it all, Star Wars: Episode IV - A New Hope. Entertainment Weekly caught up with director Gareth Edwards, who reveals that, during A New Hope, the Jedi "religion" was dying, which is explored even further in Rogue One. Here's what the filmmaker had to say below. "The Force is basically in Star Wars like a religion, and they're losing their faith in the period that we start the movie. We were trying to find a physical location we could go to that would speak to the themes of losing your faith and the choice between letting the Empire win, or evil win, and good prevailing. It got embodied in this place we called Jedha." Jedha's look was influenced by Middle Eastern locations, with "Ottoman-inspired architecture" similar to places like Mecca, Jerusalem, Canterbury or Bodh Gaya. Before this Rogue One story begins, Jedha is a spiritual place very important to the Jedi order, until the Empire takes control of this holy place. Here's what Gareth Edwards had to say about how important Jedha is to the Jedi Order. "It's a place where people who believe in the Force would go on a pilgrimage. It was essentially taken over by the Empire. It's an occupied territory... for reasons we probably can't reveal. There's something very important in Jedha that serves both the Jedi and the Empire. It felt very much like something we could relate to in the real world." While Gareth Edwards wouldn't specify what lies in Jedha that both the Jedi and the Empire would want, EW speculates that there could be a source of kyber crystals on the planet, the minerals that power the Jedi's lightsabers and were also believed to be used in the creation of the Death Star. The director also revealed that this planet is the home world of key characters such as Chirrut Imwe (Donnie Yen), Baze Malbuz (Jiang Wen) and Bodhi Rook (Riz Ahmed), a character who used to be an Imperial pilot but now fights for the Resistance. Gareth Edwards reveals that this group of rebels comes to Jedha looking for another mysterious person who could help them. 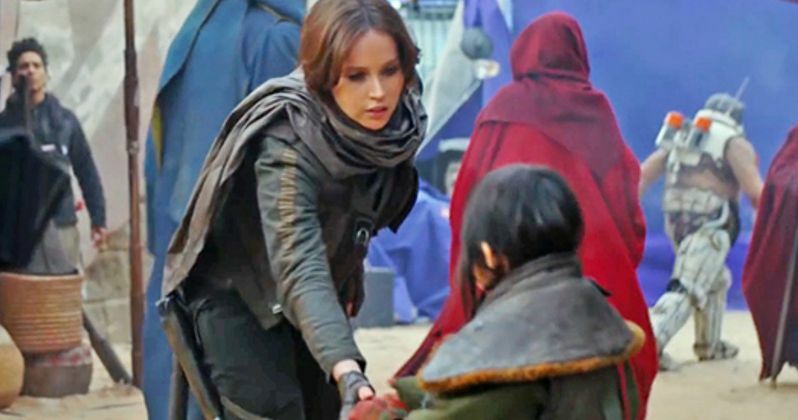 "Within Jedha, even though there's the oppressive foot of the Empire hanging over them, there's a resistance that won't give up and our characters have to go and meet people there to try and secure a person from this group. In a wider level, there must be loads of people who just believe in the Jedi and believe in the Force and have been affected by it. If it's a really ancient religion, as Obi-Wan Kenobi said, it's got to exist in thousands or millions of people in the galaxy." EW also teases that a new report arriving tomorrow will reveal exactly why Bodhi Rook still wears the Imperial insignia on his shoulder. Hopefully we'll learn much more about these mysterious characters before the trailer debuts Thursday night. Be sure to stay tuned for more updates on Rogue One: A Star Wars Story, arriving in theaters December 16.